Ghee (clarified butter) and nutrient-rich coconut palm sugar make a slightly sweet, buttery glaze for our favorite mini cabbages. Dairy-free and low Glycemic Index! Perfect side dish for anyone on a specialty diet (Paleo, primal, diabetic). Coconut palm sugar and coconut sap sugar are the same thing, however, "palm sugar" is not. Be sure to check labels carefully. 1. Preheat the oven to 375 degrees (Fahrenheit). Trim the Brussels sprouts if you haven’t done it already and pile them in a baking dish. 2. Sprinkle coconut palm sugar and kosher salt over the sprouts and dot with room temperature ghee. 3. Cover and bake for 20-25 minutes. 4. 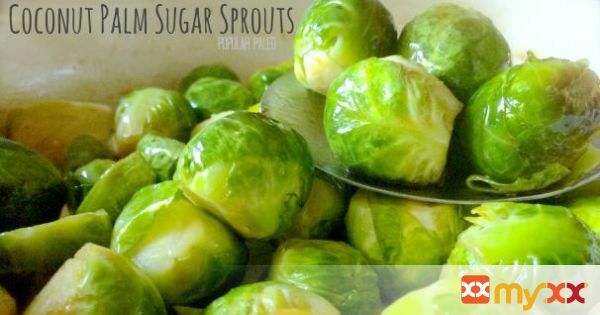 When they are finished baking, give the sprouts a gentle toss in the ghee-sugar glaze before serving.